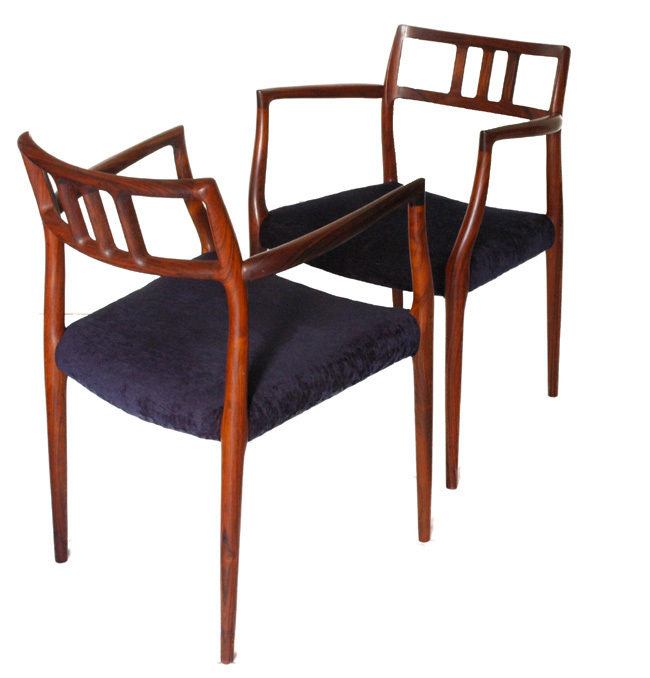 Set off eight gorgeously sculptural Danish rosewood dining armchair chairs. They are model #64 chairs designed by Niels Moller (1920-1982) in 1966 for J.L. Mollers Mobelfabrik (Denmark). All armchairs! Beautiful elegantly slim sculptured solid rosewood frames with high quality joinery (no screws) and upholstered seat pads. Without doubt one of Niels Moller most attractive and desirable designs. Particularly striking with the great rosewood color and grain. Very unusual to find eight armchairs usually you would expect two of them as part of a set of six accompanying four matching armless model 77 side chairs.